The Akron Opera House as it appears today (above) has been trying to have the historic building registered with the National Register of Historic Places. Tickets: $10 adults, $5 students. Call Joni at 712-568-3678 for reservations. Pre-show dinner: Sponsored by First National Bank of Akron. Held before the April 2 show at Akron Jo’s Restaurant across the street from the theatre. Cost is $6.95 per person with $1 of every meal sold donated to the theatre. For dinner reservations contact the First National Bank at 712-568-2472. It could have been a Thornton Wilder play: In 1905, a big-city insurance salesman comes to a small town with promises of building an opera house there if people will buy enough life insurance. The townsfolk respond enthusiastically, and the company soon erects the finest, largest building that many residents never dreamed they’d see. The “Our Town” in question would be Akron, Iowa, and it is precisely what happened with the American Life Insurance Company of Des Moines. 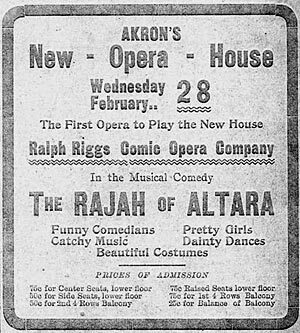 The opera house opened its first play — the comedy-drama “The Homeseekers” — Feb. 15, 1906, and presented its first opera, the musical comedy “The Rajah of Altara” Feb. 28. For years it flourished, providing the rural community with a host of musical and medicine shows and a venue for public speakers, high school graduations and social gatherings. But with the Great Depression came declining interest and attendance, and by 1940 the theatre locked its doors. An entourage of bats quickly moved in and over the next 30 years took center stage, birds and spiders a captive audience for the nightly performances. Their final curtain came down in 1970 when Akron High School drama teacher Richard G. Jacobs walked through the door. His students gave an estimated 400 bats the boot and the Akron Jaycees rebuilt the stage. One year later, the theater reopened with the musical “Paint Your Wagon” and has rolled on wheels of success ever since. While the community gears up for this week’s “Sister Amnesia’s Country Western Nunsense Jamboree,” the Akron theater’s board of directors is busy with another behind-the-scenes performance; it has been approved to proceed with registration for placement with the National Register of Historic Places and already are hard at work toward achieving that goal as the Opera House approaches its 100th anniversary. According to treasurer Joni Kjar, the board currently is with the State Historical Society of Iowa to reach the point of application with the National Register. Not much has changed since the Opera House was photographed after construction was completed in 1906. When three solicitors from The American Life Insurance Co. showed up in Akron in early 1905, its residents — mostly of German, Irish and English descent — listened carefully to what they had to say. 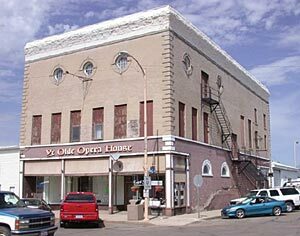 By the time the company’s vice president arrived in July, the 23-year-old town — formerly known as “Portlandville” — had embraced the idea of a new opera house. Neither was disappointed, and the project indeed became a personal enterprise for everyone involved. Akron contractor Frank Nordeen, along with main bulding contractor John A. Huxtable of LeMars, excavated the basement and laid the concrete foundation for the 46×90 foot building that included a 48-foot front elevation. Built of white pressed brick with blue pressed brick trimmings, it was Akron’s newest and largest downtown building, completed at a cost of $18,000. The first floor was occupied by the Union County Investment Company and general merchandise, and attorney W.T. Kidd had an office in the front section of the second floor. The stage extended the width of the building — 22 feet deep — with a 30-foot high ceiling and the proscenium arch 22 feet wide and 16 feet high. The Minneapolis Flour City Scenic Company painted three drop curtains with different scenes, said to compare favorably with those in other city theatres. 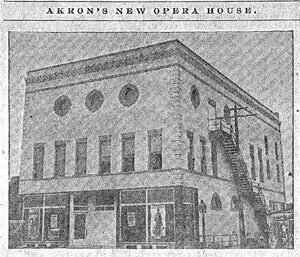 An ad that ran in the February 22, 1906 edition of the Akron newspaper proudly announces the first opera to play in the new opera house. On Nov. 23, 1905, The Akron Register-Tribune reported that brickwork was completed and a better idea gained of the building’s final appearance. “The large and handsome white structure is certainly looked upon with no small degree of pride by all our people,” the article said. Kjar says few structural changes were made since the 1906 opening, though the original staircase, which previously ran dead center up the building, was moved to the side. The balcony is still in place, though the last three rows were converted to storage space due to their height and subsequent loss of sight line. The Opera House currently tries to do four plays per year — three adult shows and one children’s — and since 1970 has done “The Glass Menagerie,” “Winnie the Pooh,” “The Odd Couple” and “You’re a Good Man, Charlie Brown,” just to name a few. The theater doesn’t boast of hosting a string of famous actors and actresses — the town already found its own hero players in the teachers, students and community: Richard Jacobs and the high school drama club, Charley Boetger, who painted every last seat, Melinda Thorson, who painted decorative designs in the metal ceiling, and there are hundreds more. They are the engines in the community that could, spending hours, days, weekends and vacations working to make it a reality.